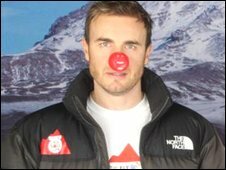 Take That star Gary Barlow has injured his back during preparations to climb Mount Kilimanjaro for Comic Relief. A statement on the band's website says that, due to a "hectic training schedule... the muscles in Gary Barlow's back have gone into spasm". It adds that the singer has been "treated appropriately" and should be able to complete the charity climb. Radio 1 DJ Chris Moyles and Girls Aloud stars Cheryl Cole and Kimberley Walsh are also taking part in the event. Barlow, 38, has been told to rest until he departs for Africa next week. The celebrity ascent is being carried out to raise money which will go towards Comic Relief's charity projects in the UK and Africa. Their goal is to raise £1 million, some of which will be used to combat malaria in Tanzania, where Mount Kilimanjaro is situated. The mountain is the continent's highest peak, at 19,330 feet.